Born in Germany in 1809, Koerner was forced to flee to the United States in 1833 after participating in a failed liberal revolution in Frankfort. A lawyer by profession, Koerner achieved admission to the Illinois bar and started practicing law in Belleville. Early in his career, he allied himself with the Democratic Party, and he quickly became a leading political voice for the growing German community in St. Clair and adjoining counties. He was elected to the Illinois House of Representatives in 1842, becoming the first German in Illinois (or Missouri) to be elected to state office. He later served as an associate justice on the Illinois Supreme Court from 1845 to 1848 and was elected Lieutenant Governor in 1852. Koerner broke with the Democratic Party in 1856 over the issue of the Kansas-Nebraska Act and the introduction of slavery to the western territories. He afterwards helped organize the Republican Party and became a close political ally of Abraham Lincoln. Koerner provided vital assistance to Lincoln during his bids for the United States Senate in 1858 (when Lincoln first achieved national prominence) and President in 1860, by bringing his German constituency into the Republican Party. Koerner helped raised several regiments from his home district during the early months of the American Civil War. He later served as United States Minister to Spain from 1862 to 1864, and is credited with helping to maintain friendly relations between Spain and the United States during the war. In 1872 he and other Liberal Republicans allied themselves with the Democrats in opposition to the Grant Administration, which had become tarnished by a series of corruption scandals. Koerner was considered as a possible presidential candidate for the Liberal Republican Party, but ultimately was chosen as the party’s gubernatorial candidate in Illinois—a contest he lost. In addition to his political career, Koerner was a prolific writer, who authored several books and was a regular political commentator in the press. The origins of Gustave Koerner’s christening would serve as an apt precursor to his later political struggles. Gustave P. Koerner was born on November 20, 1809 at Frankfort-on-Main, in southwestern Germany. His father, Bernhard, had named him after King Gustavus Adolphus IV of Sweden, out of respect for the Swedish ruler’s staunch opposition to the French emperor Napoleon I. Napoleon had defeated the two principal German powers, Austria and Prussia, in succession at Austerlitz (1805) and Jena (1806), and then bested Russia at Friedland (1807). These victories placed Napoleon in control of continental Europe, and left many Germans with a deep sense of wounded pride. Bernhard Koerner’s hatred of Napoleon was further stirred when the French summarily executed his former employer—a Mr. Palm of the publishing firm of Palm and Enke—for having sold an anti-French tract entitled “Germany in its Deepest Humiliation” (Koerner 1909:I:2-4). Once he became of age, Koerner decided to study law. He began his university studies at Jena (1828-1830) and then at Munich (1830-1831). While at Munich, Koerner had his first serious encounter with authority. After spending Christmas Eve 1830 drinking with his university friends, he became involved in a snowball fight that led to an altercation with the police. The snowball fight was harmless enough, but the authorities were on edge due to recent political disturbances. A police detachment was sent to break up the gathering, and in the process one of the officers was knocked down and injured. Implicated in the incident, Koerner was arrested and spent four months waiting for his case to be heard. He later recounted that he had studied more law during his brief confinement than he had learned in two years at Jena (Koerner 1909:I:146- 156, 160). Koerner later transferred to the University of Heidelberg, where he completed his studies and received his doctorate of law in June 1832 (Koerner 1909:I:186-187). Koerner then returned to his home city of Frankfort to practice law. He almost immediately became involved in the Burschenschaft, a liberal reform movement seeking the political regeneration and unification of Germany, and it was only a matter of time before he clashed with state authorities. In the wake of the Napoleanic Wars, the governments of Germany (as well as the rest of Europe) had become reactionary, rejecting the liberalism of revolutionary France and determined to maintain the status quo. This conservatism was exemplified by Austria, under the leadership of Prince Metternich, and by Prussia, which was the largest of the [then] thirty-nine German states and the dominant military force in the region. An undercurrent of French liberalism remained, however, in the western German states that had been included within Napolean’s “Grand Empire,” and many intellectuals and professionals there rejected the conservative trend in their nation. These feelings were stirred in July 1830, when a revolution broke out in France that resulted in the deposition of Louis XVIII and the accession of Louis Philippe, the “citizen king.” Later that year, revolutions broke out in Belgium, Italy, Switzerland, Spain, Poland, and portions of Germany (Palmer 1965:458). Although most of these revolutions were quickly stamped out, the liberal reform movement continued to spread throughout Germany, particularly amongst students and intellectuals. On April 3, 1833 Koerner and his associates attempted a coup in Frankfort, which was planned as part of a general liberal uprising throughout Germany. Unfortunately, the Frankfort revolt failed miserably, and Koerner himself was wounded while attempting to storm a guardhouse. The young lawyer was then forced to flee to France in order to avoid arrest (Koerner 1909:I:224-230, 235-236). Koerner ultimately was listed on the Das Scharzes Buch (The Black Book), an alphabetical register of persons implicated in revolutionary activities in Germany since 1830, which was complied by the Bundeszentralbehoerde (Central Bureau of Political Investigation) in 1837 (Bundeszentralbehoerde 1837; Koerner 1909:I:224-227). A plaque on Gustave Koerner Submitted by Wolfgang Stueken of Paderborn, Germany. Nearly 122 years after his death are gone. 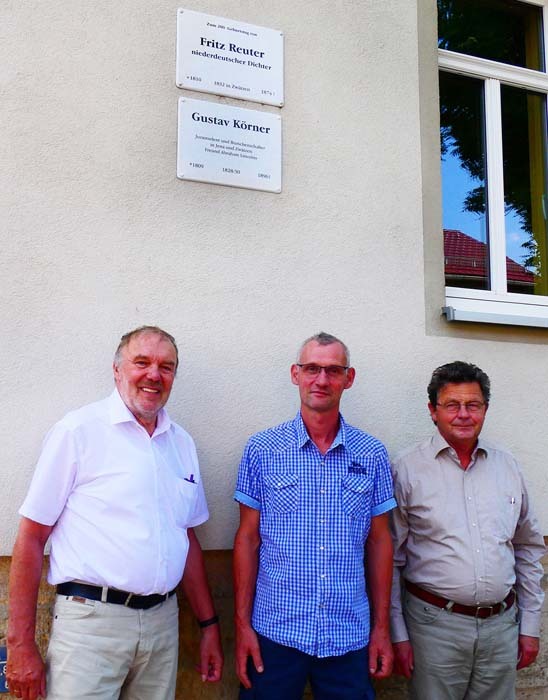 There is the first commemorative plaque on Gustave Koerner (1809-1896) now in Germany. 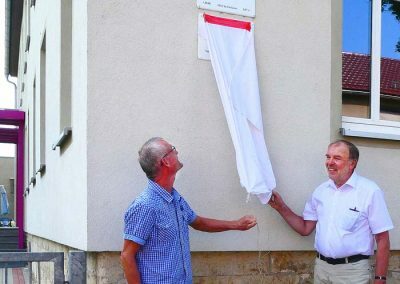 The plaque was in installed on the side wall of a former tavern in the district of the city of Jena in the German state of Thuringia in Eastern Germany. From 1828 till 1830 Jena was the university town, where the 19 years old Koerner started his studies of law. He came to Jena in a horse-drawn carriage to begin his life on university. Already on his first day in Jena he became a member of the political students club „Burschenschaft“. A radical wing of this fraternity, called „Germania“, demanded large-scale changes of the political system in Germany, and Koerner decided to follow this wing. 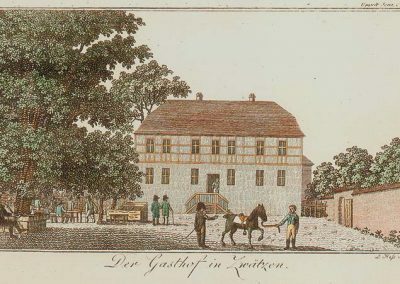 The forbidden „Germania“ had many confidential meetings and lively debates at Koerner’s time, and one oft he most important meeting points was a tavern in Jena’s neighbor village Zwaetzen. The name of this tavern became „Blaue Weintraube“ (= blue grape), cause the valley of the river Saale was (and is becoming again today) a famous German wine-region. The more than 800 years old village of Zwaetzen is a district of t the city of Jena already since 1922. 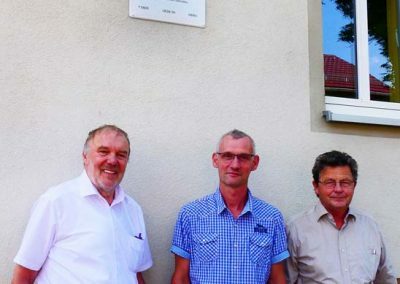 The commemorative plaque, dedicated one June 9, 2018, was installed on a side-wall of the old „Gasthaus“ by the historical association „Kulturlandschaft Zwaetzen“ (= cultural landscape, 60 members). This association invited Wolfgang Stueken, Vice-president oft he German-American Friendship Society Paderborn-Belleville, to give a lesson on the life of Gustav Koerner, as well on the German as on the American part, on the day of dedication. Wolfgang Stueken did a lot of research in Germany for the Belleville Koerner House project. 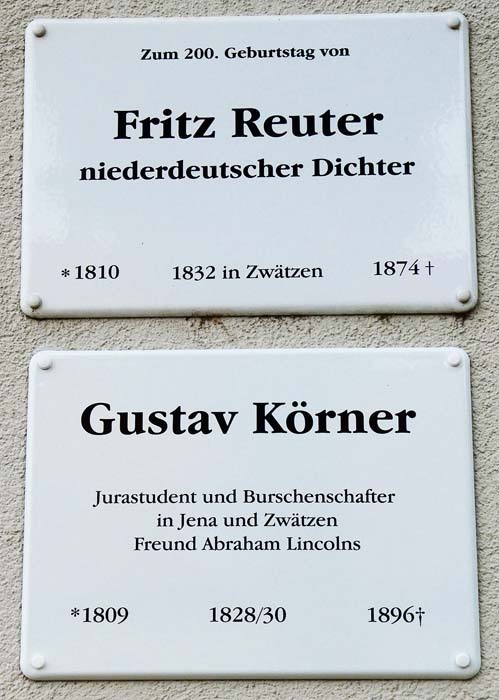 Koerner’s plaque is hanging beyond the plaque of Fritz Reuter (1810-1874), who came to Jena as a student 1832. At that time Koerner already was in Heidelberg to finish his studies. 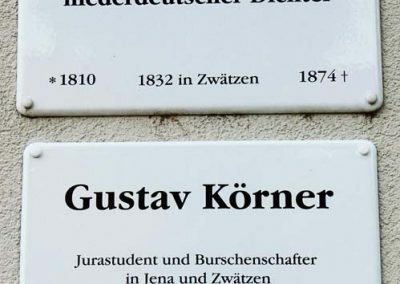 Gustav Koerner didn’t meet him personal in Jena. But in the first volume of his memoirs from 1912 Koerner remembers Fritz Reuter (volume I, pages 210-221)as a member of the „Germania“, who even was sentenced to death, but later to thirty years in fortress. Reuter became free 1840 – and a famous novellist in Low German language. And Koerner, so the short text of the plaque, a “friend of Abraham Lincoln“. Just a few days before the dedication of the Koerner-plaque in Germany, on June 3, was the final day of the great exhibition „Celebrate Illinois: 200 years in the land of Lincoln“ in the Riverfront museum of Peoria Illinois. Koerner’s doctor’s degree of the university of Heidelberg (1832), a rapier as a memory of German student duells in the time of Koerner (he himself fought such a duell 1832 against his later friend Frederick Hecker) and an invitation to the Golden Wedding of Gustav and Sophie Koerner 1886 in Belleville, loans of the St. Clair County Historical Society in Belleville, were shown in this exhibition. 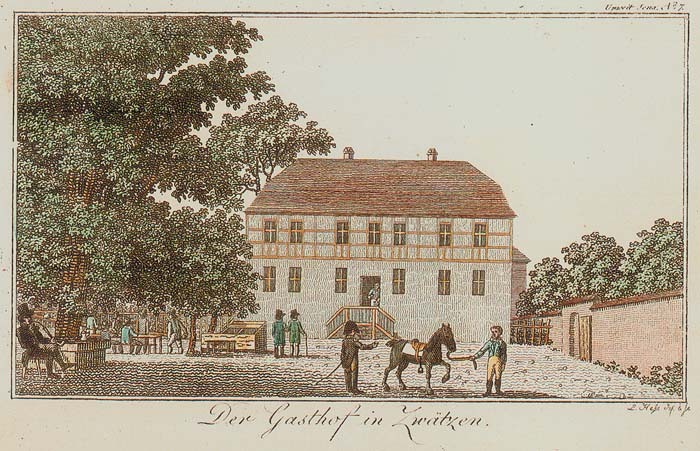 The old „Gasthaus“ of Zwaetzen on an etching of Ludwig Hess (1776-1853) from about 1812. On the left side under a tree a student, smoking his long pipe. Reproduction: Museums of the city of Jena 1999. The below mentioned local citizen and lawyer Dr. jur. (Doctor of Law) Gustav Peter Philipp Koerner is urgently suspected of participating in the storming the local military and police station on the 3rd of April of this year with group of armed men and releasing the prisoners, in which several people were killed and many wounded. 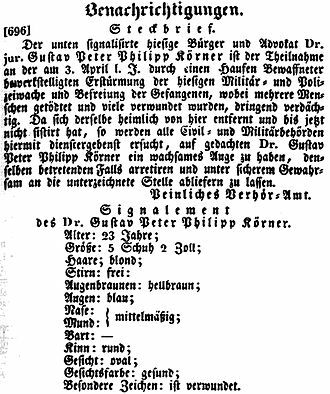 Because the aforementioned has secretly gotten away and up until now not been detained, all civil and military officials are hereby requested, to keep a watchful eye out for Dr. Gustav Peter Philipp Koerner, and in case he is arrested and in safe custody, he is to be delivered to the undersigned location. Restoring this important piece of Illinois history is a labor-intensive yet very worthwhile endeavor. Please consider donating any amount to help us preserve this important historical treasure. Contact: Jack LeChien Comments and suggestions about the content of this page: Contact Us. ©2016. All rights reserved. The Gustave Koerner House Restoration Committee. The Belleville Cultural Enrichment Organization is a non-profit, tax-exempt (501(c)(3) organization.Information may be linked to but not copied.